Tools designed for both removing and fixation of locking rings. Perfectly suitable for working in hard-to-reach places. 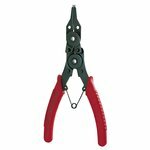 Internal-external snap ring pliers with effective range 10-50 mm. 3 replacement tips jaws included.